There are only three ways to grow a business – Get more customers; Get current customers to spend more frequently; or Get current customers to spend more $$ each time they spend. That’s it. It’s expensive to get more customers as advertising costs more and more and there are so many people advertising to the same group so if you want to Grow Your Business, the best way may be to capture more attention from your current patient base. I have read that a healthy established business should derive 50% of their revenue from existing patients and 50% from new patients. My practice is much more established and we derive 60% of our gross revenue from existing patients and 40% from new patients. There is no doubt that keeping your “base” loyal and committed is important especially since patients are living longer. Longer life expectancy has caused the Lifetime Value of a Patient to climb past $25,000 in the typical hearing healthcare practice. Just another reason to stay connected to your patients! Staying connected with existing patients is crucial for growth, so what’s the best way to do that? First of all, schedule regular appointments. The Hearing Industries Association (HIA) a few years ago did focus groups with hearing aid users and the hearing aid wearers shared that they liked regular appointments with their hearing healthcare providers. They wanted to stay connected to protect their investments. In my practice, we schedule clean and check appointments every six months and these appointments are handled by our support staff. If you are a primary revenue generator in your practice, you have to be careful that your schedule is not filled with nonrevenue generating appointments or profitability will be affected. We also offer walk in hours when patients can walk in for service without a scheduled appointment. I would recommend designating one hour in the am and one in the pm for walk in hours otherwise the walk ins will cause havoc all day long and that’s Crazy! I made that mistake a long time ago and it’s a difficult problem to fix after all these years so we have one support person designated to handle our walk ins. Another way to stay connected with patients is letting them know about new technology. If you aren’t telling your patients everyone else is. We offer an Upgrade Event every three months to patients that have aids over three years old. We have tried sharing the Event info with patients that have aids less than three years old but we have found that the patients most likely to respond have aids between three and four years old. This has been a big lesson because the other professionals in my practice and I didn’t believe that patients with three year old hearing aids would really consider new but they will! Present new technology to every patient and let them decide. It’s not a good idea to encourage someone with new aids or even someone with aids a year old that theirs are out of date, but certainly anyone having difficulty could benefit from better technology if adjustments can no longer help. We have started calling our Upgrade Events Patient Appreciation Events and this message has gotten us a better response. We mail it or email it 10 days before the event date and when it’s snail mailed we hand address the envelope. Sometimes we advertise having a manufacturer’s rep in the office as an Expert for these events. I hate that message! What are we if we aren’t Experts? But, I will tell you that the message gets a better response from patients. You can’t argue with what works. The bottom line is helping patients hear better and if the message works, I am not opposed. Each time we have these events, it’s Great for Business and Great for Patient Satisfaction. Give it a try! Patients want to hear better and they depend on their professional to let them know what is best and what will help. That’s it for now. 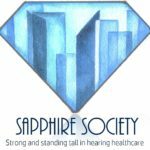 If you would like a copy of our Patient Appreciation Letter, go to DrGyl.com and join my new Sapphire Society! Only $99 a year for monthly resources to help you grow your practice. Go to https://drgyl.com/subscribe/sapphire-society/ to sign up.